AdPrint - Most of participants at AdPrint 2018 are our clients. Most of participants at AdPrint 2018 are our clients. 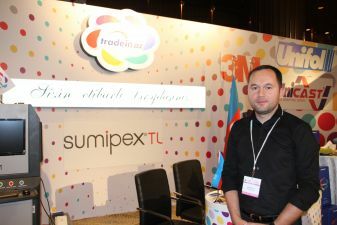 For eighteen years, Tradein has been the leading importer of printing machinery and raw materials for advertising products in Azerbaijan; we sell over two hundred items online. Among them, large-format printing machines for street advertising, banners, vinyl, paints, organic glasses, promo stands, photo paper, wallpapers for print, canvas and much more from leading manufacturers from Europe, USA, Turkey, the UAE, etc. Information about our products, prices and producer countries can be found on our website (tradein.az). Our customers include about seven hundred public and private organisations and companies specializing in street advertising. I am confident that the vast majority of participants in the AdPrint exhibition are our clients. In many respects, such high results were achieved due to the preservation of the balance of price and quality. One of the fields of our activity is printing promotional products. But we strictly adhere to the laws of the market and do not take advantage of a supplier of raw materials, when forming the prices for printing. At this exhibition, we present exactly the imported equipment and raw materials, but not our services. We are satisfied with the progress of the exhibition. We had a lot of interesting meetings which will hopefully develop into a cooperation in the future.